December 17, 2017 / Filed in: lipstick, liquid lipstick, product review, Vice Co.
Let's face it. The holidays are here and Christmas is fast approaching, which also means there'll be Christmas parties to attend. I don't know about you but I tend to have a standard, glam Christmas look which includes sparkly eyes and a vibrant red lip. I've gotten a little nonchalant with my current red lipsticks so I decided to hunt down a new one. Since Christmas parties tend to involve a lot of eating, I wanted a lipstick that didn't only look great but could survive all the festive food binging. 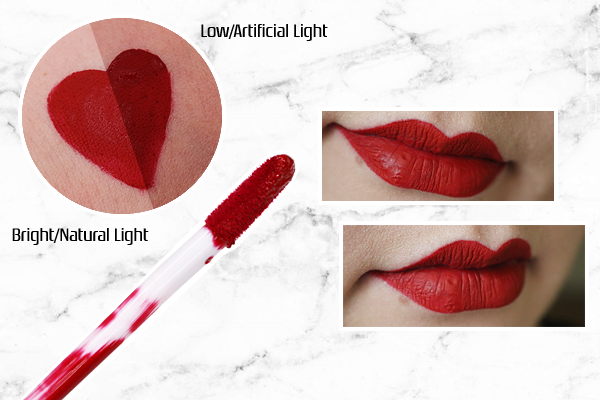 When I saw the much hyped about Vice Cosmetics toting one of their many lipsticks as 'the perfect red matte liquid lipstick', I figured that was the one to try. 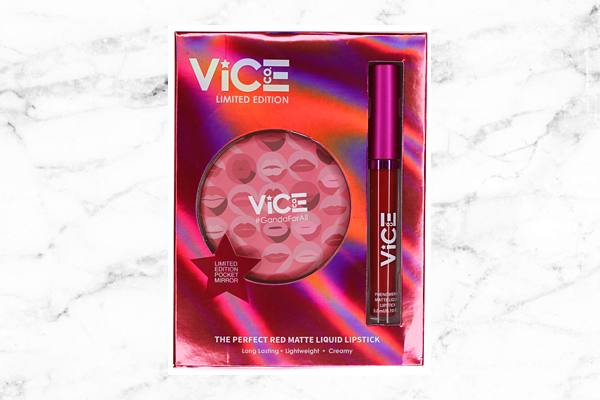 It's the Vice Co. Blockbuster Phenomenal Holiday Kit (Php295). 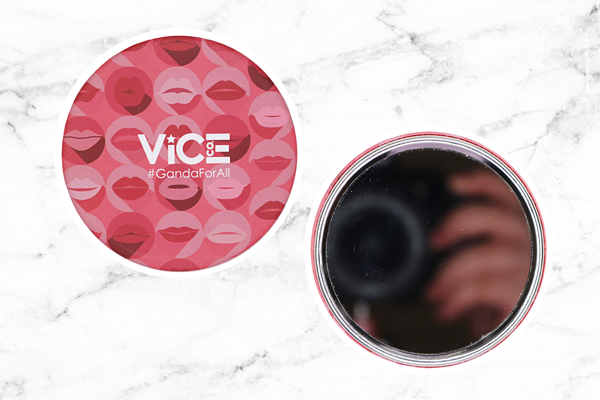 Vice Co. says, "Ganda ('beauty') is in your hands right now. A vibrant pop of color on your lips that's light and lasts all day. It's smudge-proof and comes with a beautiful matte finish." Can I just say that packaging is on point for this? I already heard a lot about Vice Co.'s lipsticks, both good and bad, but this box caught my eye from way across the store. Look at how shiny and pretty it is! Since this is a limited edition kit for the holidays, the lipstick came with a freebie which is this hand-held mirror. It's a fairly nice one, I'll admit. I like the design on the back and the size makes it perfect for popping into any bag or vanity kit. I already have a portable mirror though so I just gave this one away. Applicator: The lipstick comes with a typical, doe foot applicator. While I always prefer one with a more pointed tip for better precision, it's flexible and applying the lipstick can still be easy and precise even if you have a defined cupid's bow like I do. Color: Currently, "Blockbuster" is a limited edition shade that's exclusive to the holiday kit, and like pretty much any other lipstick out there, the color of this one depends on your current lighting situation. Under natural and bright light, it appears as a deep but still vibrant red. Under low or artificial light, it's an even deeper, almost wine-like red. I've actually gotten a few compliments from both strangers and friends when wearing this and they said the color really suited me. Finish: Boy, when they said this had a matte finish they meant it. After applying, it sets quickly as matte within just a couple of minutes. It feels very dry on the lips though. You know how poster paint feels when it's dried? That kind of matte, almost powdery finish? That's what this lipstick feels like when worn. If you're not used to wearing lipsticks like this, unlike me, it'll take some getting used to at first. That said, it doesn't really highlight dry patches, even if you apply this without lip balm which is good. BUT, if you have defined lip lines, it will highlight those like you can see in the picture. Staying power: A compromise for the really dry feel of this on your lips is that this lipstick has some good muscle when it comes to staying put. After eating and drinking, even when eating oily foods like fried pork, most of the lipstick stays intact. The only real disappearing act happens in the inner lip area, and sometimes on the corners, which are easy to retouch and aren't as noticeable. Since your inner lip area is always wet, you have to expect more fading to happen there anyway. Is this smudge-proof too? Well, no lipstick is 100% smudge-proof. If you rub hard enough, yes, this will smudge. But with light rubbing and planting kissing the back of my hand, still no smudge and no transfer!